When I did the ancient map from Harold the Webbed last time, i already had a second one in mind. This is a map of legendary Persia, and it isn’t quite as fanciful as the map of Viking Britain that Trader Horn gave us, but it does show a rider on horseback and thus contains the same travel theme as the last one. 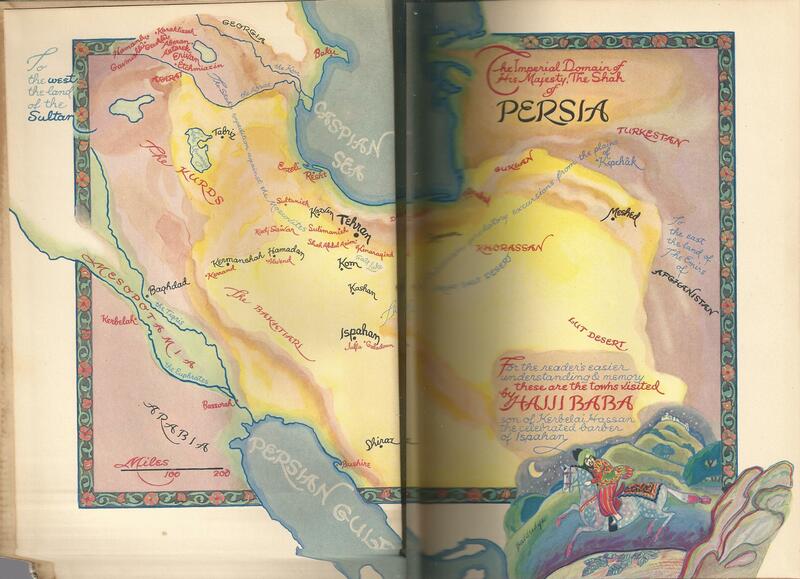 This map comes from a book called THE ADVENTURES OF HAJJI BABA OF ISPAHAN by James (Justinian) Morier; illustrated by Cyrus LeRoy Baldridge. New York, Random House, MCMXXXVII (1937). Hajji is a kind of Islamic Huck Finn, and his adventures serve to illustrate the nature of life in medieval Persia (which is now Iran). The book is well written, well bound, oversized, well illustrated with both color plates and black and white line sketches, and seems to have made almost no impression on the American public at the time. As it turns out, James Morier was a British diplomat and novelist who lived in the early 1800s–this book was first published in 1824. Morier spent part of his life as the British ambassador to Persia–he spoke the language and knew the country intimately. Both artist and illustrator have articles about them in wikipedia, and both seem to have been outstanding men of their time. 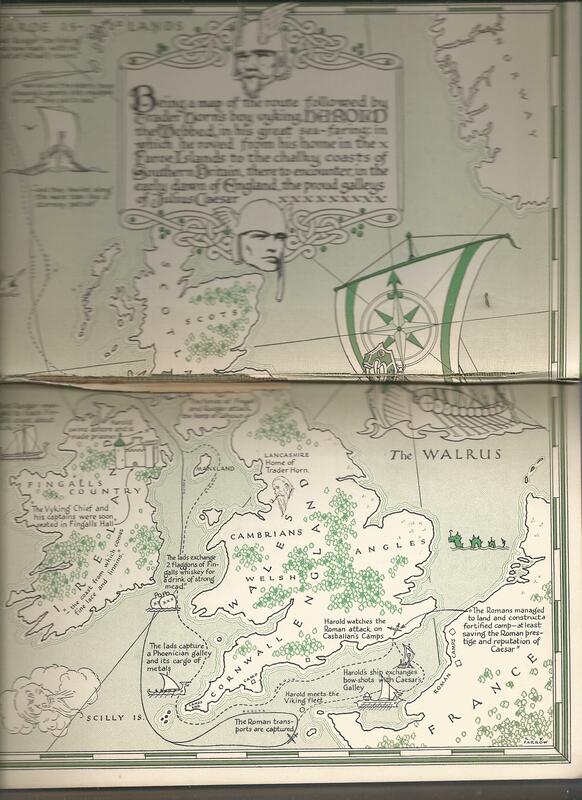 Baldridge did the gorgeous illustrations that fill the book, and my guess is that he did the map as well. The map spreads across two pages as a kind of frontispiece before the title page. I had to scan it as two pages. My son James did a little cut and paste and cropping magic to put the two pages together for this picture. Hajji is more of a historical novel than a fantasy in the same sense that Tom Sawyer is a historical novel. It still seems like something from the Arabian Nights. If you have ever read anything by James Morier or seen the art of Cyrus Baldridge, please leave a comment.